After two years of not recording anything, “the internal clouds began to part” for SourceCodeX (aka John Patterson) and out came Rebirth, a suite of healing music pieces. Created using microKorg and Akai Miniak synths, the music here is for the most part soft and slow, calm and meditative. Patterson finds places to darken up the proceedings somewhat, as on “Winter Night,” where the requisite cold-wind sounds issue out of his synths. That sound effect carries over into “Northern Lights,” at which point Patterson goes a bit overboard with it. Theme is one thing; hammering a theme is another. 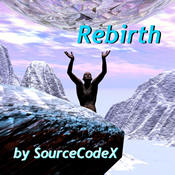 The core of Rebirth comes in a trio of longer pieces, “Daybreak on the Sea of Galilee,” “Clouds Parting Soon,” and the aforementioned “Winter Night.” They are all deep flows, “Clouds…” being the best of them. There is something very affecting in its bright, patient tone. Rebirth is probably better enjoyed at a lower volume. I find that up close it sounds a bit thin. Patterson doesn’t layer a lot of sounds at any given time. Much of the work here seems to come down to play chord, hold chord, move to next chord. His core sound set doesn’t change up much, either, so while the tone is consistent, it sometimes begs for a shift in sound. Played softly, the warmth and quiet of Rebirth come through. Pull out the “darker” tracks and this would make a good backdrop for meditation or massage.